This year I only went a single Sunday morning to check out Capital Factory’s AR/VR Megalounge. 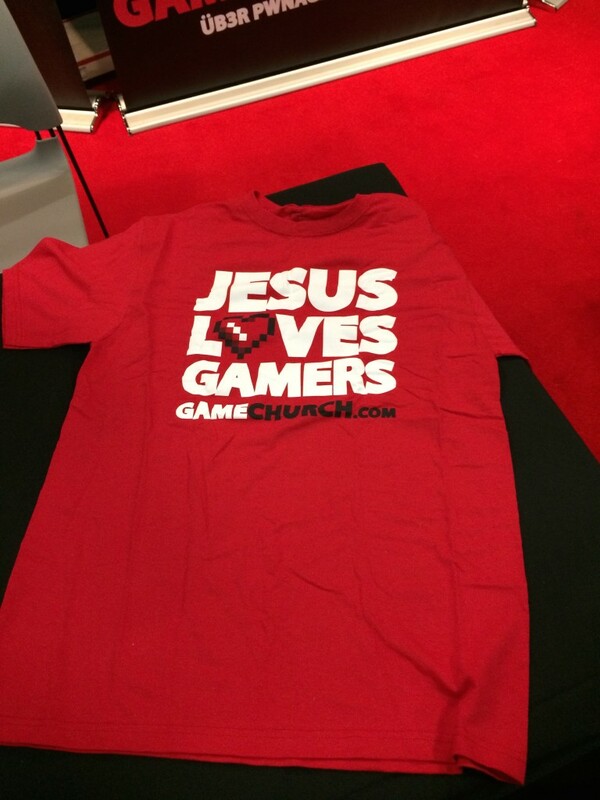 And get me some swag. They had a good amount of mostly unfinished games for the HTC Vive. Best of all: no lines. Bonus: free food and drinks. I was pulled into a demo by Groove Jones in which you play a Tron-like disc game in a Tron-like environment against your opponent. I won several matches in a row. 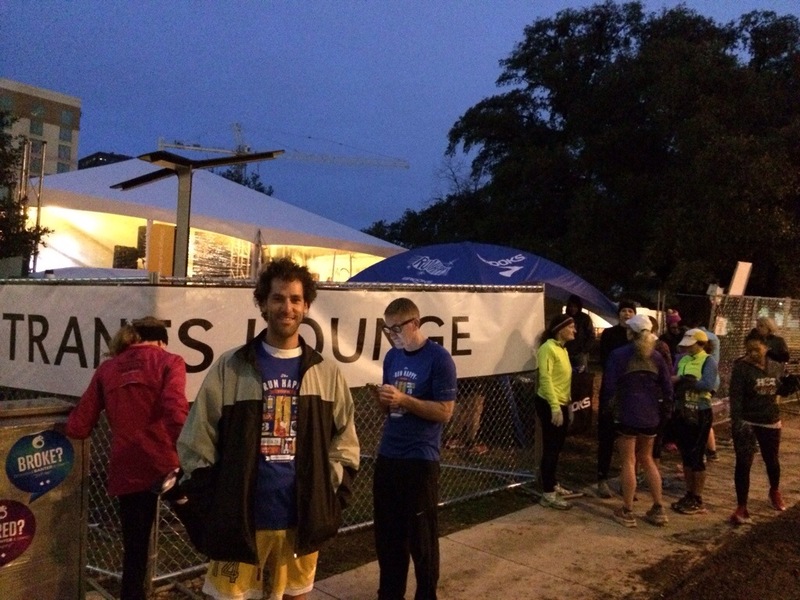 Unfortunately, my old body didn’t handle the intense activity well and I ended up with a torn hamstring. 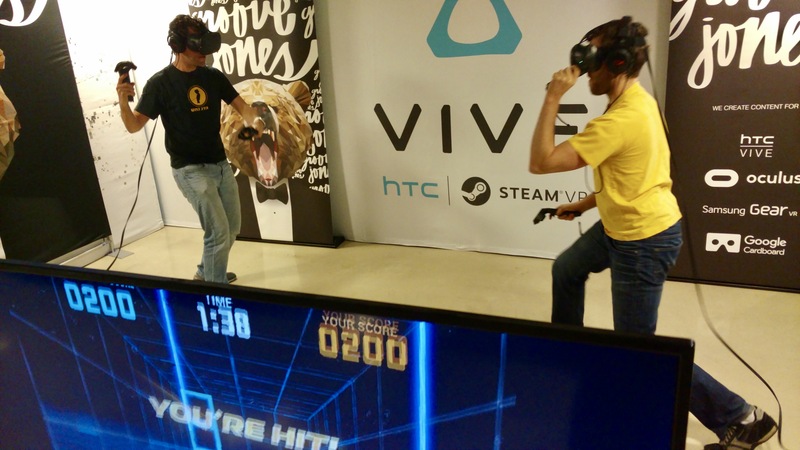 Marcos and Jaime battle it out in Virtual Reality. Since I was already downtown, I decided to walk around a little bit to see the sights and get some free toys. This in spite of my leg pain. 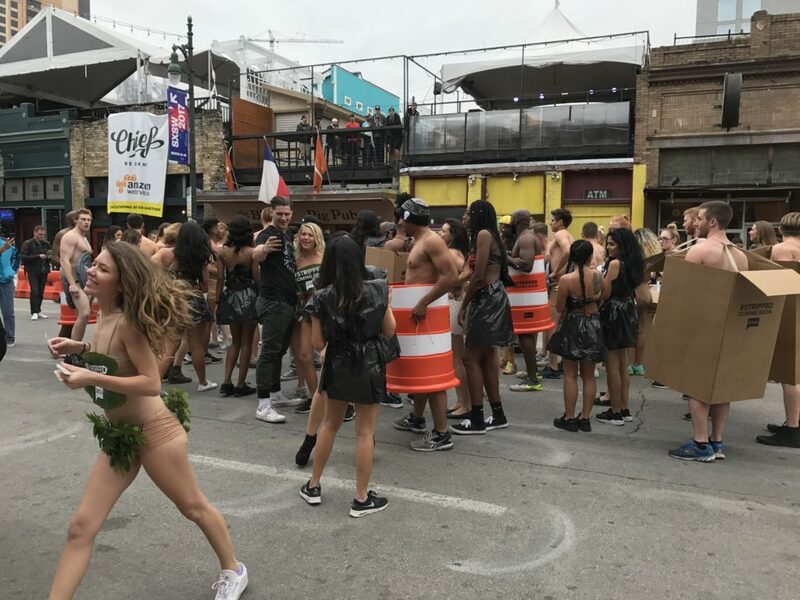 As I strolled down Sixth Street, I saw a large crowd of barely clothed good looking people walk towards me. I had to double check: it wasn’t Halloween nor Mardi Gras. What could it be? 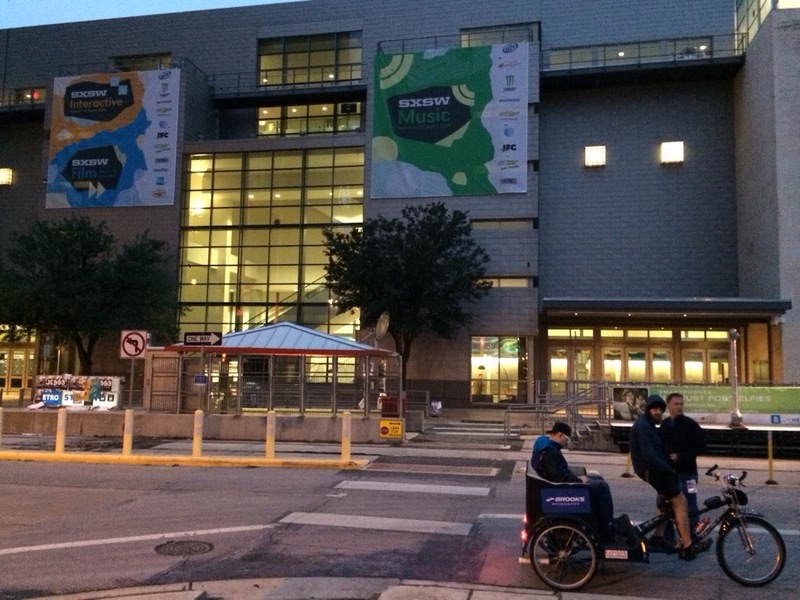 This is SXSW, so of course it was an advertisement for something. However, just to make sure, I decided to stick around and pay close attention to all details in order to make sure. It became obvious that I wasn’t going to get a free t-shirt from this crowd (maybe a free trash bag), but luckily Panasonic gutted out Parkside and turned it into a giant booze and t-shirt dispensing advertisement. 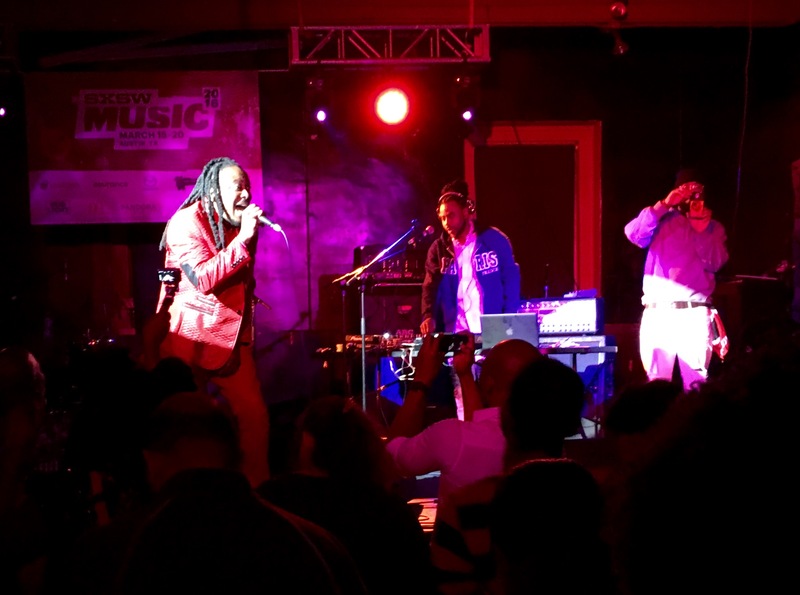 This year my SXSW experience was different than previous years – other than for the fact that I also wasn’t able to get Jimmy Kimmel tickets. 1. 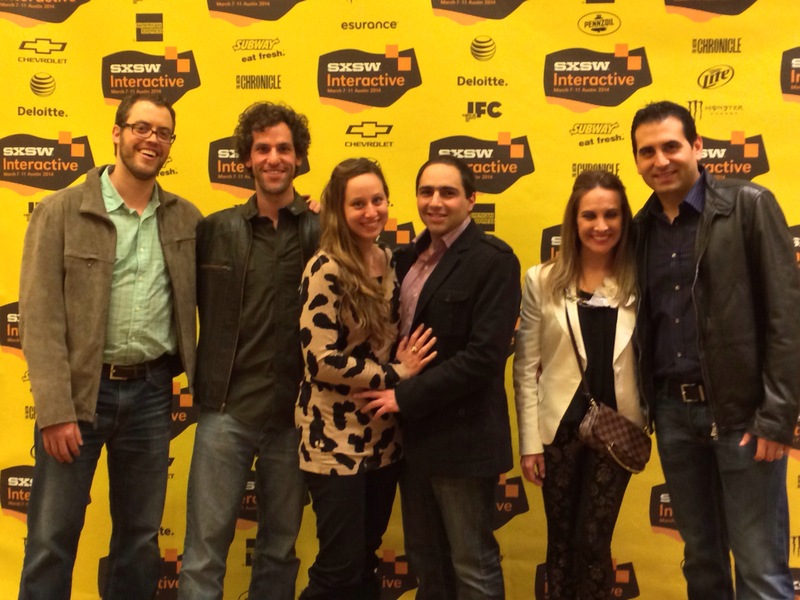 Amit from Israeli startup MobileODT came to represent the company in the 2015 SXSW Accelerator. So I went in to provide moral support and video recording during the pitch. They were great. It was also cool to see the other startups: some with very creative ideas, some with extraordinarily shallow and pedestrian ones (these make money), and some that were science fiction and likely lies. 2. Eli the shark came to check out the festival in general. He’s been threatening to come for years and finally made good on it. We got to check out a bunch of sessions. 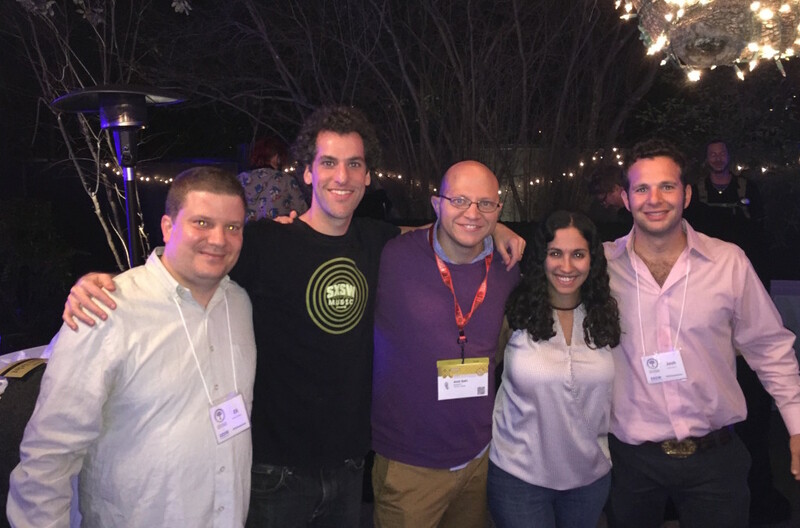 Eli, Marcos, Amit, Shlomit, Josh at ROI party. 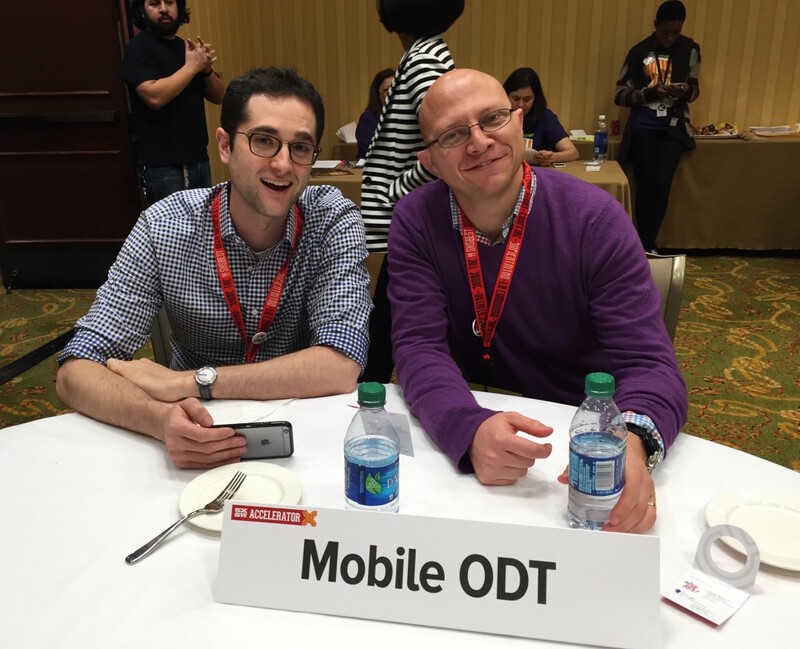 Behind the scenes at SXSW: Jonah and Amit getting ready for their presentation. 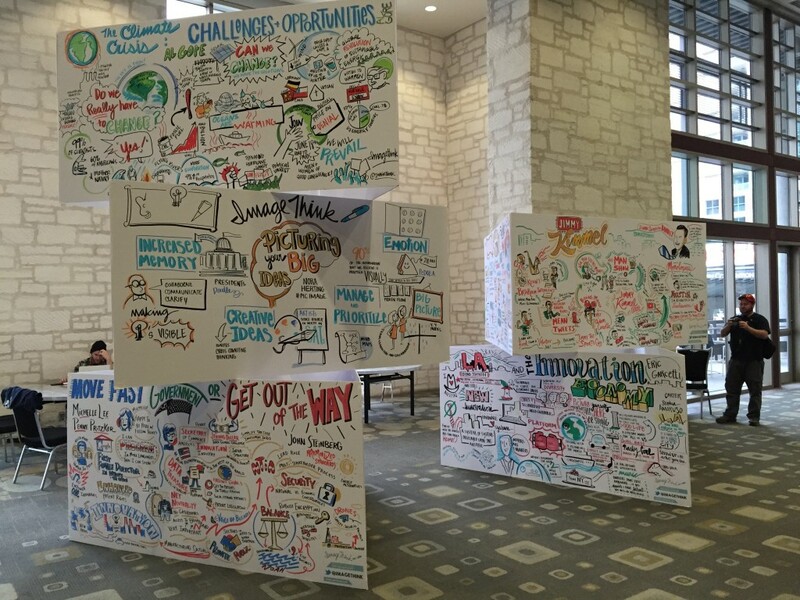 Artists illustrated presentations in real time, which were later displayed at the Austin Convention Center. 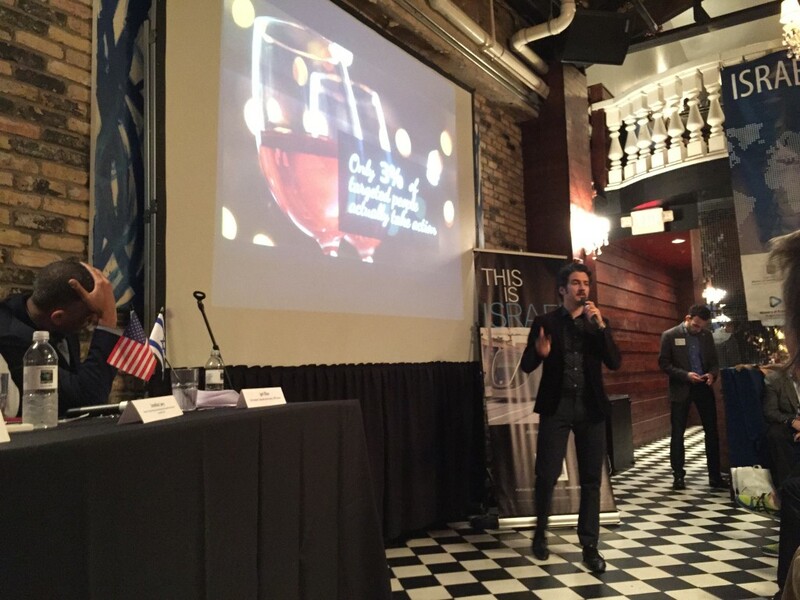 Israel Innovation Showcase + Israel Startup Nation Networking Event. Free Hummus + 1 drink ticket per person. 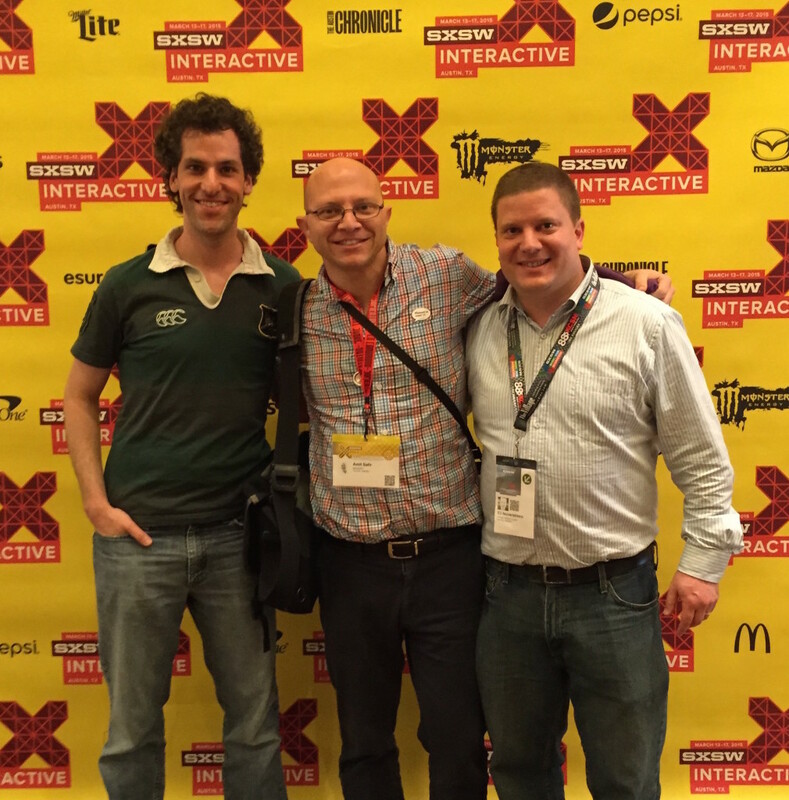 Albert was in charge of SXSW this year. Prerequisite event ultra corporate busy background photo. 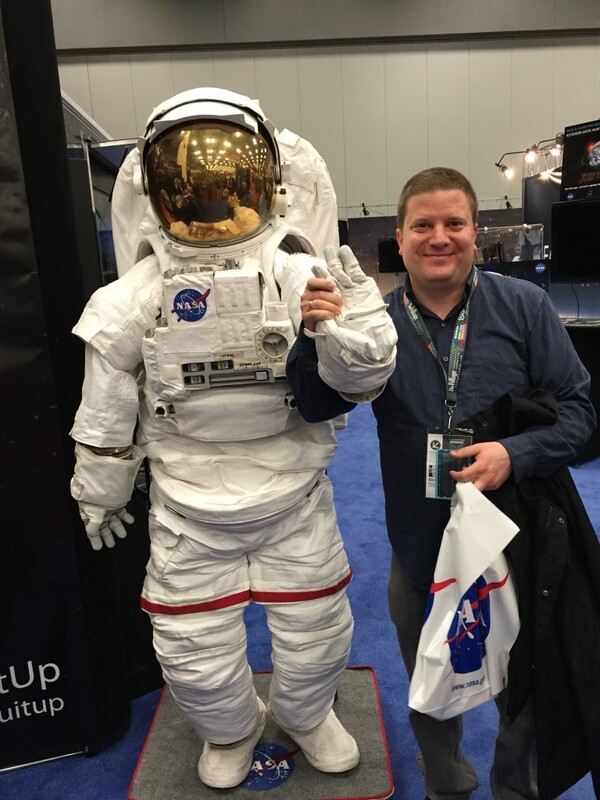 A very short astronaut holding Eli’s hand at the SXSW Interactive Expo. More importantly, I met the team behind SmartyPans in person. They’re nice. 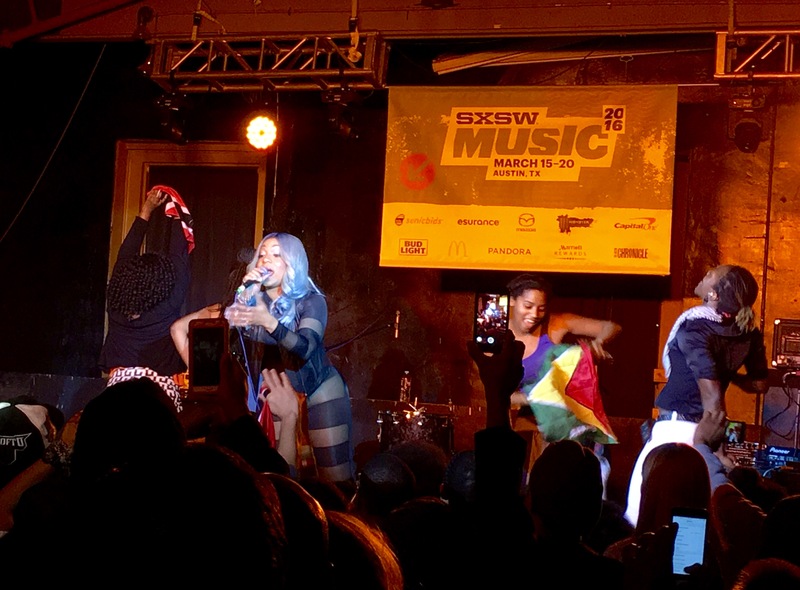 Last SXSW 2014 post. Argentinian duo Illya Kuryaki and The Valderramas was in town. Since they don’t sing in English, most locals have no clue who they are. I credit my coolo shaking skills more to them than I do to Miley. Los Petit Fellas: I missed them but was told they were very good. Rebel Cats: Odd Mexican band than plays 50s rock. Rarely do you see a bass being abused so badly. División Minúscula: Reasonably well known Northern Mexican band that play indistinct generic rock. Porter: Guadalajara based electronic rock. Lead singer seems like a nice guy. Not quite done with SXSW-related posts just yet. Myself (lead writer of this blog), Louise Kahn (lead singer of Terry Poison), Albert (lead singer of his shower), Jason (not a singer but quite a dancer), Anna Landesman (SynthGuitar and B-Vox). Photo-bombed by Jeff (lead founder of Vonage). In the middle of SXSW Interactive, right before the music festival begins, I went to this event organized by the Government of Israel Economic Mission and Israel Bonds. 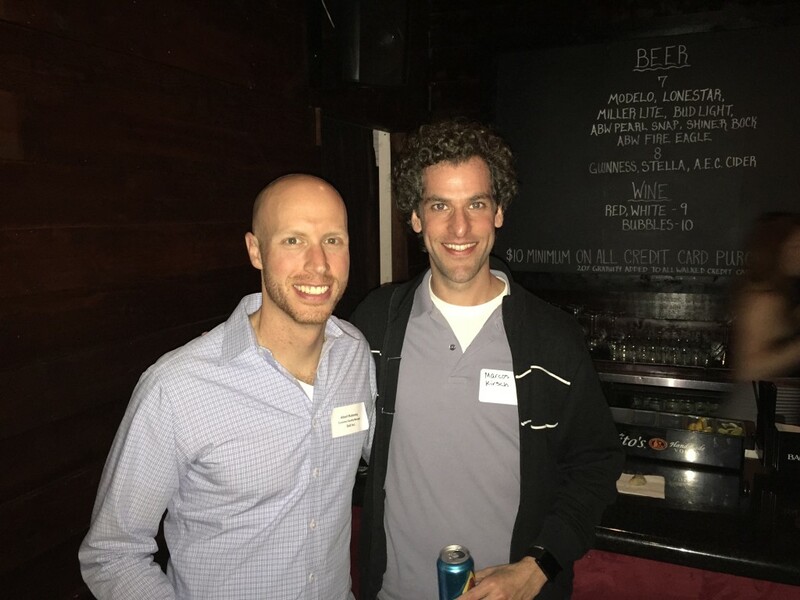 There was food, drinks, music, and a bunch of interesting start ups showing off their work. Israeli band Terry Poison played after the event. Really good show… the singer climbed on to every wall in the bar in her heels. Very daring. Read: “South by South Westeros”. Hahaha, get it? (their tag line, not mine). 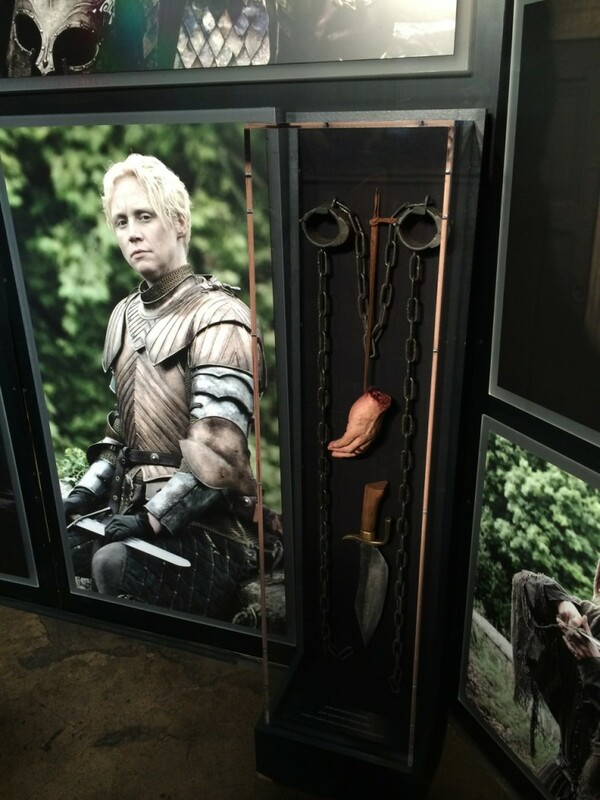 If you don’t get it, then you probably don’t watch HBO’s popular TV series Game of Thrones. If you don’t watch it due to its premise (dragons! fantasy lands! magic!) I don’t blame you, but I guarantee that if you can get past your prejudices, you will like it. 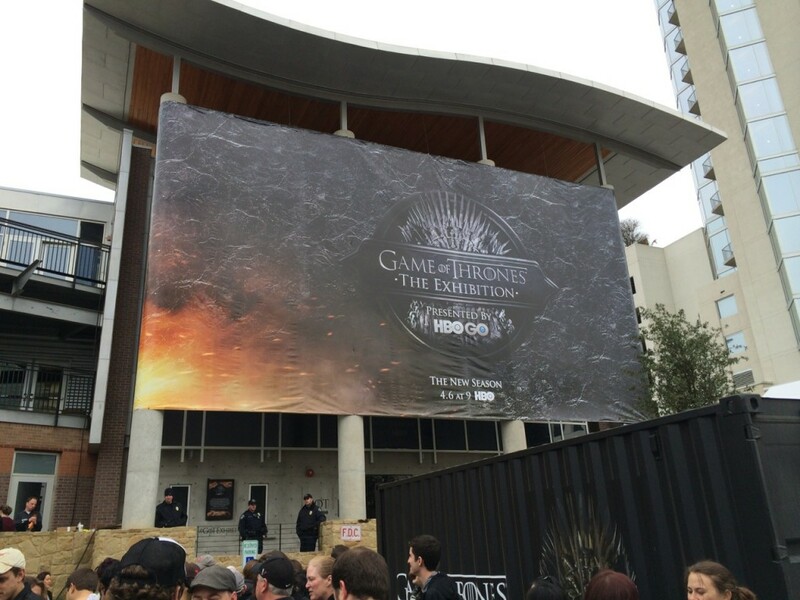 In any case, HBO has put together a Game Of Thrones Exhibition and they brought it to Austin for SXSW. What they did is take props from the show, which are impressively detailed and well made, and put it all up on display as if it were a museum. It’s very cool to see for fans of the show. It’s also very sad that you never ever see a line this long in order to get into a real museum. The hand is fake, I’m 75% sure. 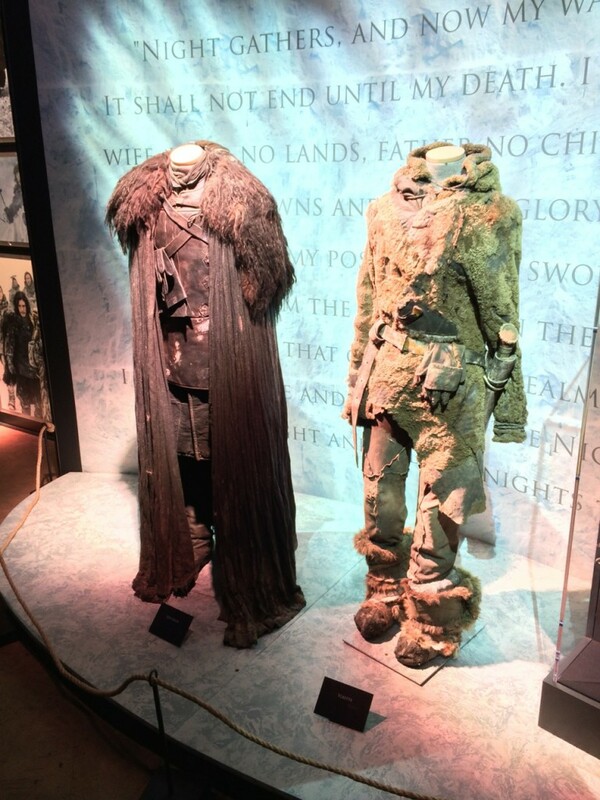 Impressive amount of work went into the costumes. You can look at them up close and see how they faked the wear and tear. 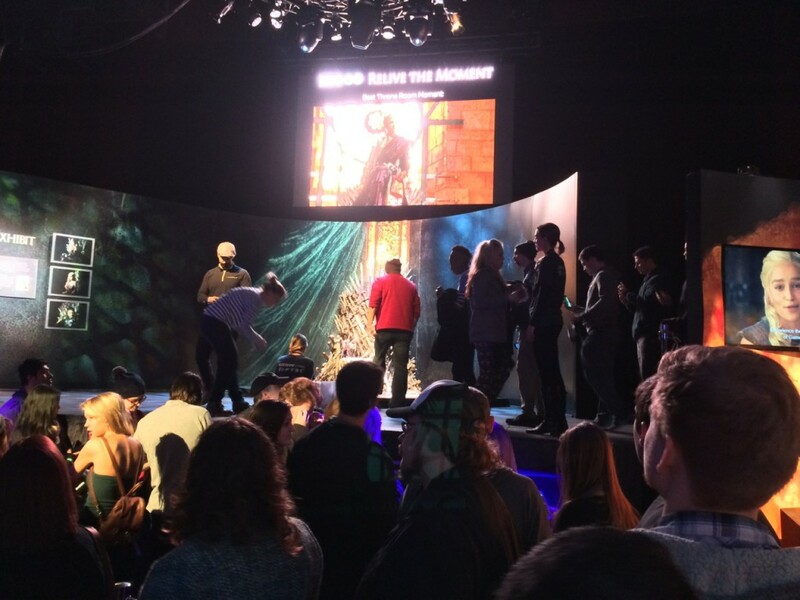 They also had a replica of the iron throne that you could sit on and have your photo taken (wait time: 45 minutes) and an Oculus Rift powered Wall of Ice elevator simulator (wait time: 180 minutes) that look unbelievably cool. Unfortunately for the reader, I did not wait in line for either. The state of virtual reality today is equivalent to the state of tablet computers a few years ago. Many people thought it was a great idea and kept building them failed – but failed (Microsoft Tablet PC). Eventually everyone gave up on it: “nobody wants tablets”. Years later, technology catches up and someone (Apple) tries again and finally gets it right: iPad. Turns out it was a good idea from the beginning, but no got it right. 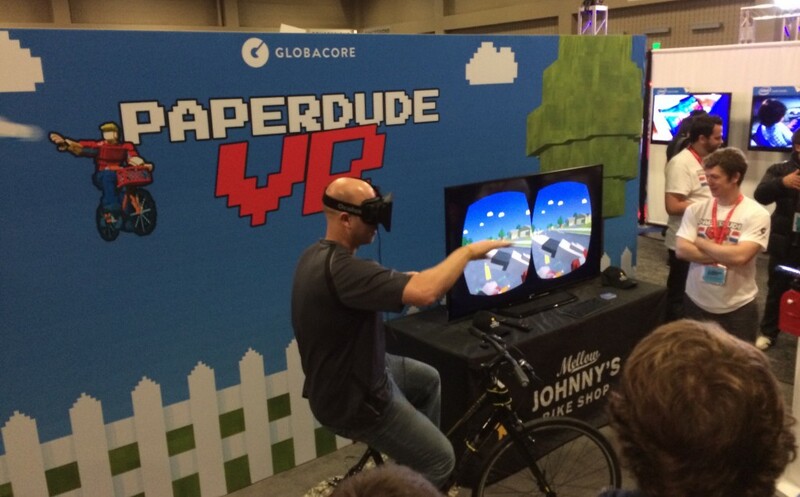 Do the people at OculusVR able to do it right? Yes, or at least they’re very close. In summary: goggles with cellphone screen in front of each eye and gyroscopes/accelerometers, all connected to a powerful computer. The computer creates left-eye and right-eye images to match what you’d be seeing. 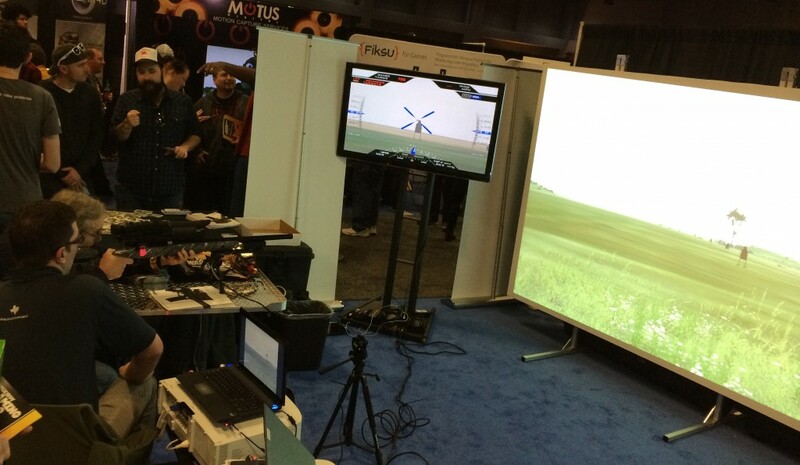 OculusVR already shipped hardware development kits and a lot of people are creating games and demos. The demo I tried, unlike most which show computer generated 3D surroundings, was of a pre-recorded performance of a musician. 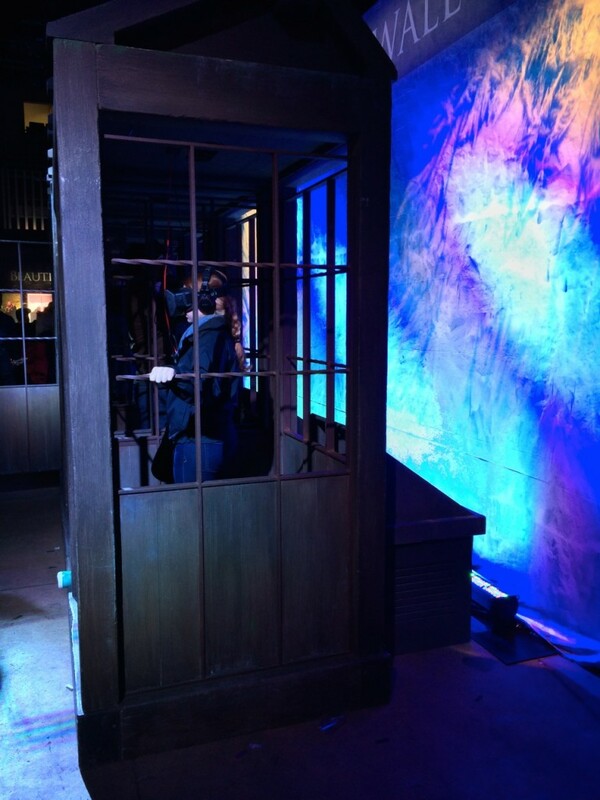 It puts you on a chair inside his studio. He walks in, sits down at the piano, and starts playing. You just sit back and look around… at the piano, at the apartment, at the dog next to you. 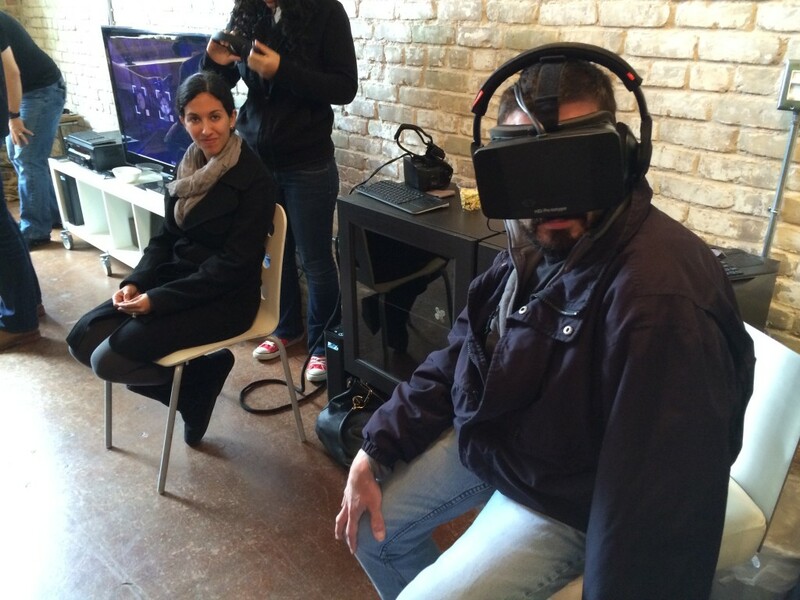 It was weird: when you put on the headset, you are suddenly in a room larger than the one I was actually in. 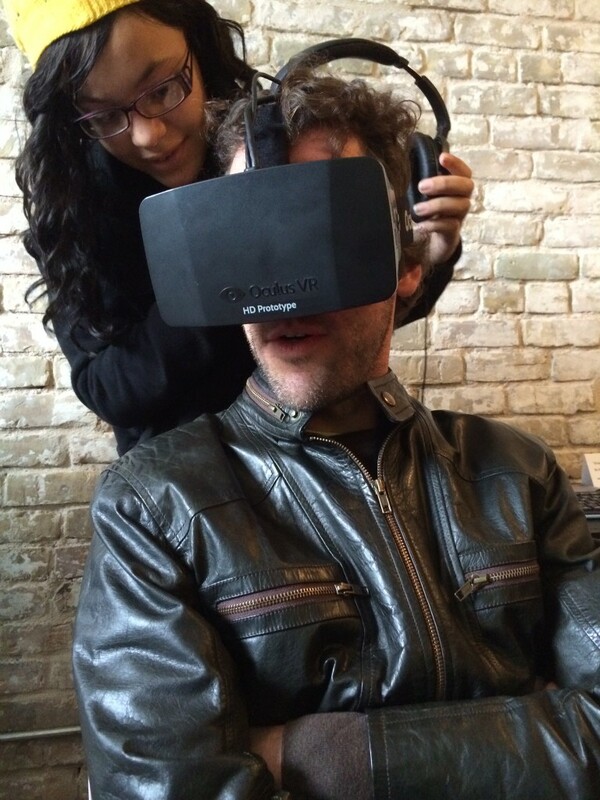 I tested a newer 1080p prototype of the Oculus Rift. The screen door effect was notable and the pixels still obvious. I suspect that even at 4K you’d be able to see the pixels, although they’d be a hell of lot less distracting. If I moved my head quickly, the image would ghost and fall slightly behind. Lots of Oculus Rift demos with insane lines. More on this in a future post. 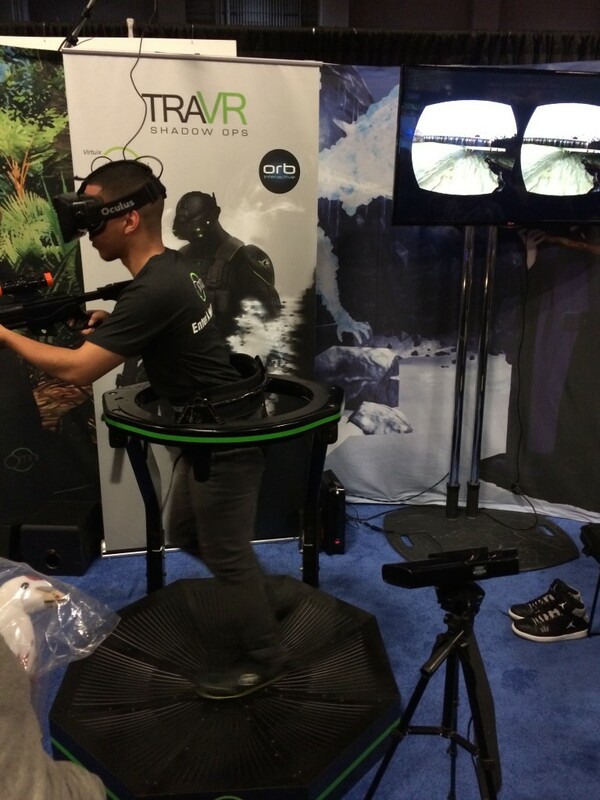 A guy playing some shooter wearing a n Oculus Rift and standing on a Vertex human-sized trackpad: use your feet to walk around! Paperboy is probably the most popular worst video game ever. Now someone is working on a virtual reality version of it! A very cool Dallas-based company Captured Dimensions makes a room-sized 3D scanning rig. Panorama photo inside the Captured Dimensions digitizer. Yes, those are PowerGloves on the screens. I don’t know why. 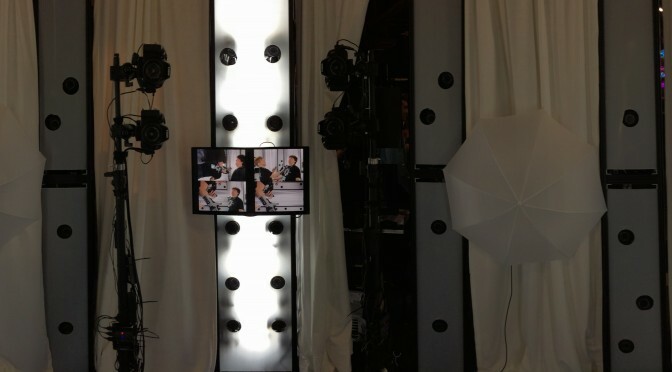 They can take your picture, digitize it, and then 3D print figurines, or holograms, or whatever. A 3D printed figurine of Marcos would make an excellent addition to The MKX® Gift Shop, wouldn’t it? I was tempted to make one but I think prices will drop quickly as this technology becomes more commonplace. 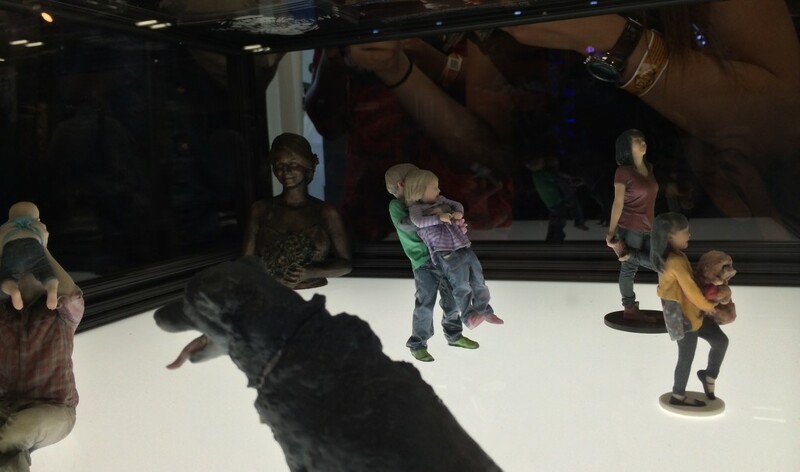 Full color 3D prints of digitized people at Captured Dimensions booth. See the arm in the background for a sense of scale. 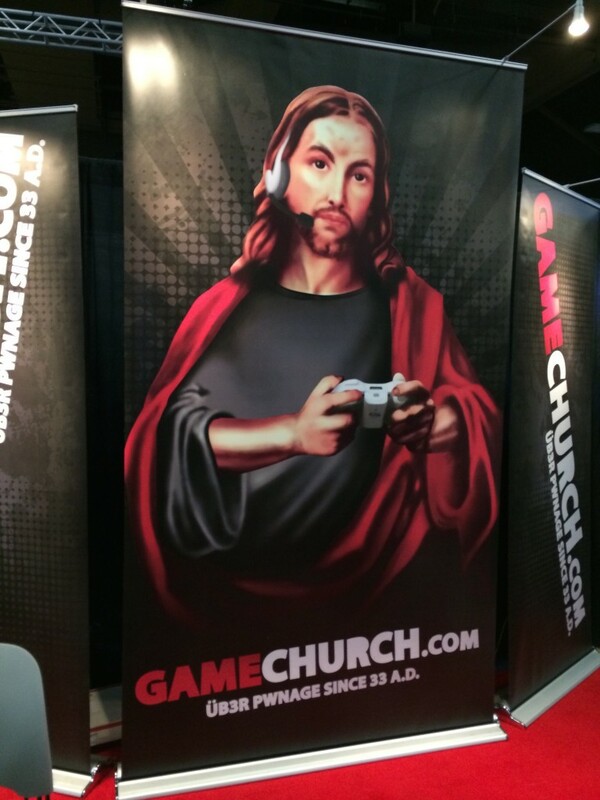 …even Jewish gamers, I was told. This is not a toy gun. This computerized gun sight will shoot to kill.